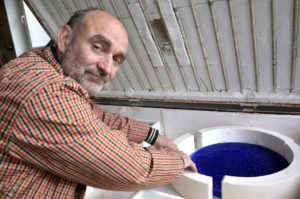 Vitrucell is the latest achievement of Zdeněk Lhotský, a glassmaker, designer, technology expert, and entrepreneur. Transparent molten glass, technology of which is close to that of float glass, is built on a honeycomb-like structure. Its technical specifications stipulate that the maximum weight of one piece of glass made with this technology is 300 kilogram and the maximum size of one panel is 130 x 270 cm (minimum thickness of 2 cm).